Wolf's railroad accident investigation team has analyzed and reconstructed several hundred railroad related incidents, including vehicular crashes at railroad/highway grade crossings, railroad yard injuries, train derailments and pedestrian strikes. 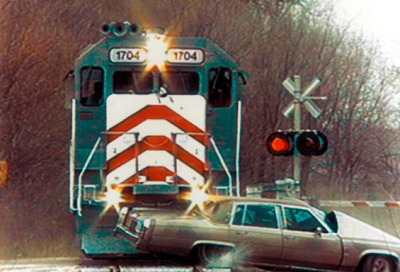 A 4,000 pound car stopped on a crossing is no match for a 262,000 pound locomotive, even when the locomotive is only traveling 22 miles per hour. The passengers are likely to suffer serious injury or death when they are involved in such a collision. But, even with such weight discrepancies, the laws of physics still apply and by using those laws, we can often reconstruct the events that led to the collision. By determining sight triangles, examining damage patterns and rest positions, we can often determine how fast the car and train were moving just prior to impact. Information from event data recorders in both the car and train may add additional information as to what each operator was doing in the time period prior to the collision. Trial animations often allow us to see and demonstrate the operators’ respective points of view. With that information, we can often establish who, if anyone, could have avoided the collision and how they might have done so. While investigating nighttime pedestrian strikes, we developed a particular expertise in modeling train headlamp illumination patterns to determine if and how far train crew members might be able to see individuals/objects within the track gauge. These math models have been tested in the field to verify their validity. As members of the National Association of Railroad Safety Consultants and Investigators (NARSCI), Wolf personnel make presentations at annual meetings and have access to a network of experienced individuals from a broad spectrum of the railroad industry. Read an article about a Wolf train derailment investigation.